2006 Honda Accord Pros and Cons | Page 1 of 2 | Why Not This Car? What drives people to buy (or not buy) a certain car? TrueDelta's members share 2006 Honda Accord pros and cons based on their real-world driving experiences. The Accord Hybrid gets better gas mileage than TSX. The Accord averages almost 30 MPG in 85% city driving. My Accord covered 68,000 miles without missing a beat. It did go through 2 batteries but never left me stranded. This was a great car with respect to reliability. The new look stlye, tail lights and front grill chrome. The 17" mag wheels off set the look. Peace of mind as my wife drives this car more than I do. I also feel that the reliability factor adds to the resale of the car. Consistent 32 MPG no matter how hard or conservative I drive it!! I received a $3500 incentive for buying a "left-over" car. 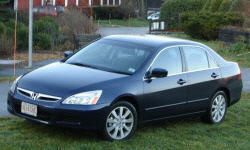 I purchased a new 2006 Accord in Jan/2007. The engine is very strong for being a four - I thought we were driving the V6 at first. Best of all, the power comes on very smoothly and the engine revs effortlessly. The only beef I have is that the auto trans shifts a bit harshly at times. My Accord averages 32 mpg and has achieved as high as 34 mpg. This is exceptional for a car of this size and comfort. I must have hit the dealer at the right time because I am paying less for the V6 6SP than I was paying for a 2003 EX-L 4 cyl w/5SP and with no money down, only first months payment due at signing. Roof line makes it feel cramped and with low visibility. I have gotten over 35 mpg on the highway.